This entry was posted in Travel, Travel Photos and tagged 50 Year Project, Animals, Blog, Blogging, England, Holland Park, Life, London, Nature, Photography, Squirrels, Travel, Travel Blog, Travel Journal, Travel Photo, Wildlife. Bookmark the permalink. That’s a long way up (and down)! Yes. and they show no fear. Of course! Good thing I had my rabies shots. But I don’t think they have rabies here. Just how many shots did you have to get for the upcoming trip? none for this one. But when I went to Africa I had to get a lot. Rabies alone is three shots over a period of time. I think one day I got 4 or 5 shots in one arm. I didn’t feel well that night. I’m still up to date with my shots. Had to take pills for typhoid and will take malaria pills while there. One of my shots, can’t remember which one is good for 30 years. That’s my favorite one. Ok, now I get it. It’s not that you don’t need shots to go there – it’s just that yours are up to date. Sorry, I’m a little slow :). No worries, when the doctor said I didn’t need any I started to argue. Then I realized that I was actually asking for shots. I hate, hate, hate, hate, hate needles. I used to have to get blood tests done a lot and oh man, every time people would have to give me pep talks. Really? I haven’t been to your neck of the woods. So you have them over there, too! Awww…that’s really cute! At our previous home, there was a squirrel that would taunt our dog. Have the squirrels you’ve seen done that to Miles? We have a couple of squirrels at our current home that just fly through the trees. They are fun to watch, and even more fun to watch them fly over to us (ok, I guess they don’t fly, but they can jump really far) when we hold out a peanut. The squirrels hate Miles. The only reason I was able to get this photo was because Miles was at home taking a nap. Once they see Miles they start yelling and then run off. Maybe I need to carry peanuts with me. Almost did not see the squirrel! This time he was safe. 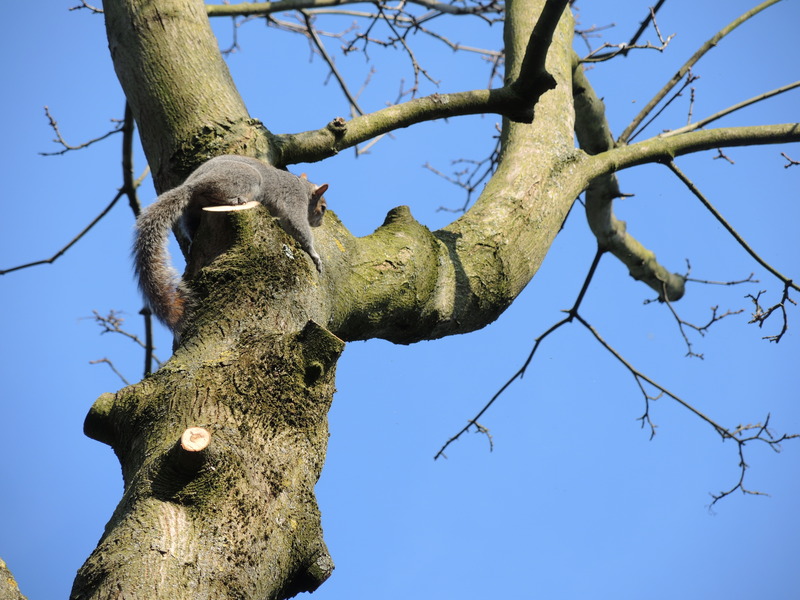 I have seen a squirrel fall before, but he got right back up and climbed the tree. Love the proverb. I also like the Japanese proverb: Even monkeys fall from trees. I agree. Not sure which one I prefer. A squirrel can scamper up so high and fearlessly because it is genetically wired to survive if it falls 9 out of 10 times. What could we learn from this? Could you visualise yourself as a squirrel with this knowledge? What would you do then? So what could be our learning from such behaviour? I love your perspective. God bless! Thanks. I’m curious about your answer to your question. Those squirrels are tricky little critters. Thanks for the like of “Quarter Moon Meets Feisty Cloud”. They are clever. I love watching them. Ah yes I can relate as well. Lots of obstacles in life. they are amazing problem solvers. no matter how “squirrel proof” a birdfeeder is, they find away to empty it.